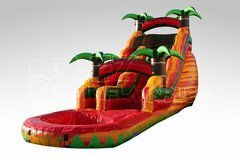 512Bounce offers the BEST water slide rentals in Austin and the surrounding areas at affordable prices. If you're looking to bring some fun and excitement to your next party or event, our inflatable water slides are a must have for cooling off in the hot Texas sun. Our water slides are all incredibly eye catching. From our beautiful 18' Tropical Water Slide with its blue and green colors, to our "HOT" 18' Fiesta Water Slide. This beautiful piece would be a wonderful addition to any tropical party. Can't decide between one of our bounce house rentals or an inflatable water slide? Why not have the best of both worlds. Our combo bouncer rentals are perfect if your guests would love to bounce AND slide. Take a look at all of our great options here. Our large inventory enables 512Bounce to take care of all your party rental needs. Whether you're looking for a cotton candy machine rental, a fun inflatable obstacle course or one of our dunk tank rentals, we have you covered. Planning your next party or event has never been easier. Simply choose your date, select your items and book your event, right here on our website. If you'd prefer or have any questions, please don't hesitate to call our friendly, knowledgable staff at (512) 783-4643. 512Bounce serves our clients with delivery service, rental set up, and clean up. We are right here in Pflugerville, TX and we are insured completely satisfying all state requirements for Texas. We are actually a family-operated and Veteran-owned local business. We have the utmost pride in how our people operate our business. Our patrons can expect professional service with a smile and well taken care of products. We utilize lead-free USA-sourced inflatable rentals and on top of that we thoroughly clean our inflatables after every job. During our clean-up procedure our team is qualified to thoroughly inspect for damages or potential issues in areas that may need routine maintenance or fixing. Our dispatch staff is qualified to set up our rentals safely, to present themselves properly, and to be well-mannered at all times. We will deliver our concession machines to any of the following cities: Austin, Bastop, Round Rock, Leander, Buda, Wimberly, Hutto, Cedar Park, Pflugerville, Georgetown. We are based right here in Pflugerville, TX and we can take care of party rentals for home parties, church events, festivals, corporate special events, and much more.